Apple has been talking with a number of banks about the service, including J.P. Morgan Chase & Co., Capital One Financial Corp., Wells Fargo & Co. and U.S. Bancorp. Most person-to-person services allow users to send money to friends or others via an app on cellphones, typically by putting in the recipients’ phone number or email address. The transfers are generally free. 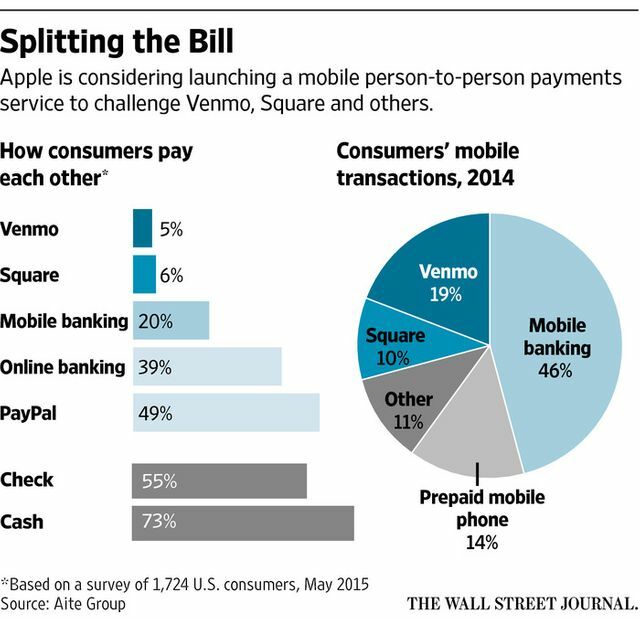 Venmo is one of the fastest-expanding services, accounting for 19% of mobile person-to-person payments. It is favored by young adults and teenagers who particularly like a feature in which they can list their payments on a social-media feed. Consumers made $2.1 billion of mobile payments using Venmo in the third quarter, up from $700 million in the year-earlier period, according to PayPal.